SQL 2017 – Microsoft announced in April 2017 that the next version of SQL Server RDBMS and Business Intelligence software is officially named SQL Server 2017 and made a new Community Technology Preview (CTP) available for download. SQL 2017 – referred to as “SQL Server vNext” has been released in a series of CTPs since late last year. The latest SQL Server 2017 Community Technology Preview 2.0 is the first production-quality preview of the upcoming offering, available for both Windows and Linux. 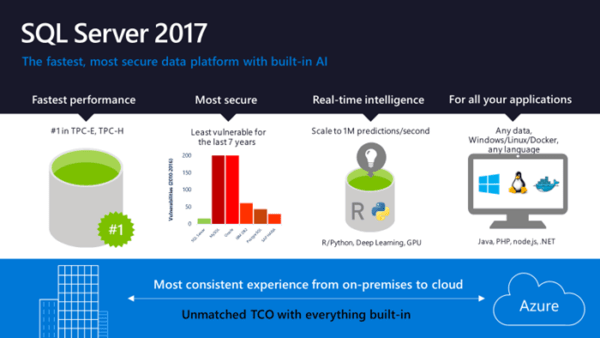 “In this preview, we added a number of new capabilities, including the ability to run advanced analytics using Python in a parallelized and highly scalable way, the ability to store and analyse graph data, and other capabilities that help you manage SQL Server for high performance and up-time, including the Adaptive Query Processing family of intelligent database features and resumable online indexing,” the SQL Server team said in a blog post on April 17th 2017. Gain trans-formative insights with up to 1 million predictions per second using built-in Python and R integration, and get end-to-end mobile BI on any platform. This is a key area of extension into the fast growing Data Science, Predictive Analytics and Big Data arenas. The inclusion of R and Python is a bonus for those organisation that have invested heavily in a Microsoft estate but also need to cater for growing demand for R Language and Python Data Science tool-sets. Build modern applications using any data, any language, any platform—on-premises and in the cloud. Steve to doświadczony konsultant Business Intelligence i praktyk z ponad 20 rok doświadczenia dostarczając szereg Business Intelligence, Analityka i Big Data Solutions. Steve pisze obszernie na temat najnowszych trendów i technologii na rynku BI i szerszego wykorzystania w przemyśle.